HempCare RAW 5% CBD oil is a full spectrum hemp extract in which both Cannabidiol (CBD) and Cannabidiol acid (CBDa) are strongly represented. The CBD oil contains four different extractions which are free of purification and filtering. In this way, the important cannabinoids are not lost and HempCare RAW 5% CBD oil contains the best that nature has to offer. 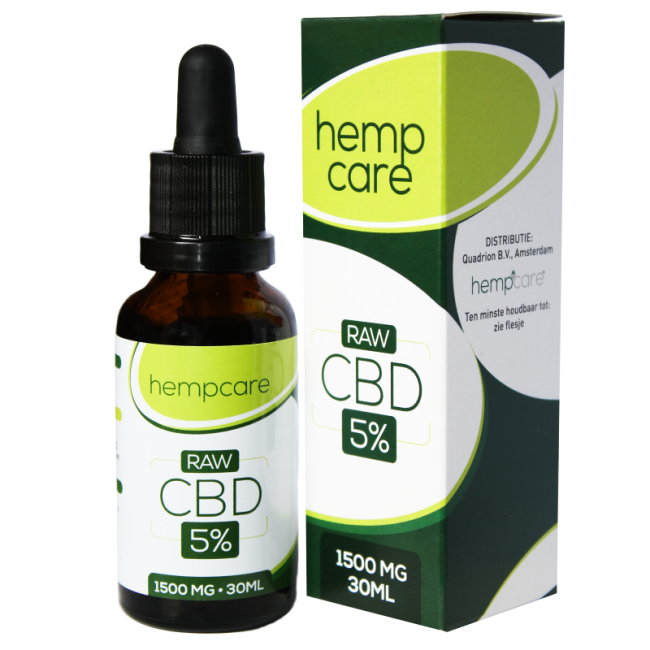 HempCare CBD RAW 5% consists of all important components of the hemp plant. In addition to the main ingredient Cannabidiol, these are other cannabinoids and flavonoids, terpenes and phenols. It is a complete natural product with substances that our body recognizes and absorbs. CBD RAW contains no psychoactive ingredients. Cannabidiol (CBD) predominates in CBD oils. Other ingredients are present to a lesser extent. However, CBDa (Cannabidiol acid) has a special place in HempCare CBD RAW. With the growth of the hemp plant, this sour CBD first arises. During the production of our CBD RAW we retain this CBDa because it enhances the effective working of CBD. But it also has positive characteristics in itself. Different studies show that CBDa can help, for example, against nausea and vomiting. The human body itself produces cannabinoids, which have been discovered throughout the body. These so-called endocannabinoids (endo = internal) do not differ from phytocannabinoids (phyto = plant). CBD oils activate and / or stimulate the production of body's own cannabinoids. The body appears to respond directly to the intake of CBD from several studies. In many cases, the effects are only visible and / or tangible after a few days. For proper functioning and stimulation of the body, every CBD oil must be used for at least five days up to 3 weeks. When experimenting with dosage, it is important to take this into account. Hempcare recommends starting with 10 drops of CBD RAW twice a day under the tongue. Leave it there for about 20 seconds. The effect is only visible and / or felt after a few days. In case of an undesirable reaction, the recommended intake can be reduced. In all cases this intake can also be increased. The body only absorbs what it needs, the excess secretes it in urine, perspiration or otherwise.